Gov. Rick Perry on Thursday doubled down on his stance that tens of thousands of children crossing into Texas illegally from Central America should be sent back to their countries without delay. 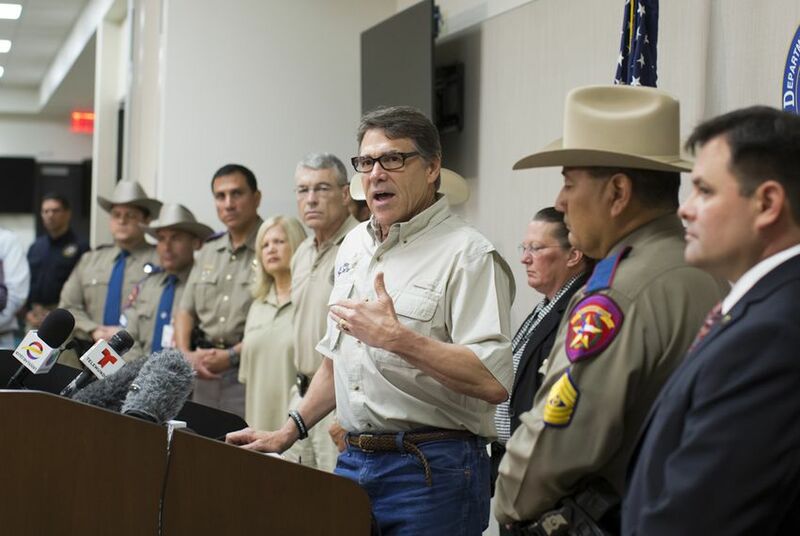 Perry, appearing before the U.S. House Homeland Security Committee in McAllen, joined committee Chairman Michael McCaul, R-Austin, in calling for National Guard troops on the border. McCaul said they needed to be given the authority to do more than “push paper behind a desk." The number of unaccompanied minors entering the U.S. over its southern border has reached record levels. In the last nine months there has been a 99 percent increase over the previous fiscal year. The figure includes a 178 percent increase in the U.S. Border Patrol's Rio Grande Valley sector — from 13,532 to 37,621. Perry testified that his office has requested since 2009 that 1,000 National Guard troops be placed on the border — until 3,000 more U.S. Border Patrol agents can be trained and moved to the region. McCaul said that according to current Department of Defense policy, however, the National Guard is relegated to supportive roles. “We need to do it in a way where the National Guard can do their job,” he said. Perry said the National Guard has had a presence in Texas before in drug interdiction operations. He agreed with McCaul that freeing up the soldiers to work on border security operations would benefit the state. “We do not need to have them have one arm tied behind their back in this process,” he said. Thursday's hearing also gave Democrats a chance to push back against their GOP counterparts, who have labeled the surge on the border a “national security crisis” and blamed the president’s policies for the influx. U.S. Rep. Sheila Jackson Lee, D-Houston, cited the administration’s record number of deportations as proof that it is not lax on border security. She also said that she doubted a 5-year-old child could be “calculating enough” to try and convince his classmates to follow him on the dangerous trek northward. The detained Central American children she has visited are “orderly and polite,” she said, and "simply want to be free from murderous conditions." Jackson Lee told the committee she always takes something to the unaccompanied children she visits across the state, and her recent trip to McAllen was no exception. Hidalgo County Judge Ramon Garcia said during his testimony that he feared people were confusing the two issues: the children’s exodus from their countries and securing the border. Perry's testimony came a day after he said he supported stopping any aid to Mexico and Central America until those countries made a concerted effort to stop the illegal migration. He added on Thursday that Texas should be reimbursed for the "$500 million we’ve spent securing the border over the past decade." The Texas Democratic Party called the governor's statements "gun-slinging, cowboy foreign policy." “Here in Texas, we don’t turn our backs on our neighbors," party spokesman Emmanuel Garcia said in a statement. "For as long as Rick Perry has been governor, you’d imagine he would have learned that. The challenge we face requires a strong commitment to constructive collaboration between local, state, federal and foreign governments."